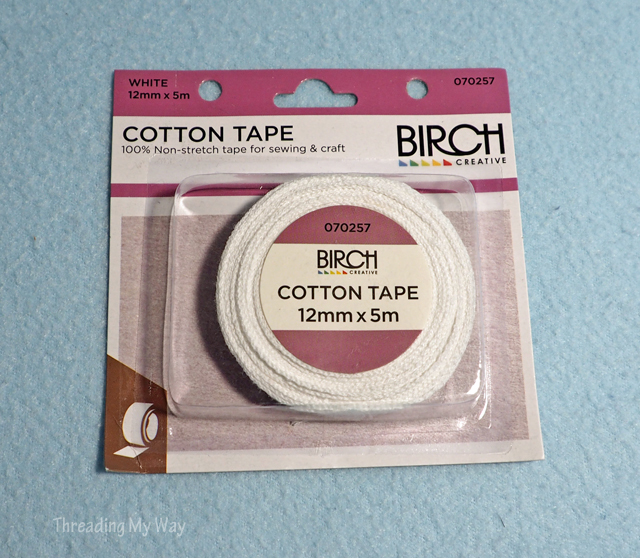 About a month ago, I had a bee in my bonnet about how Birch cotton tape was packaged and priced in Spotlight stores (equivalent of Jo-Ann stores). 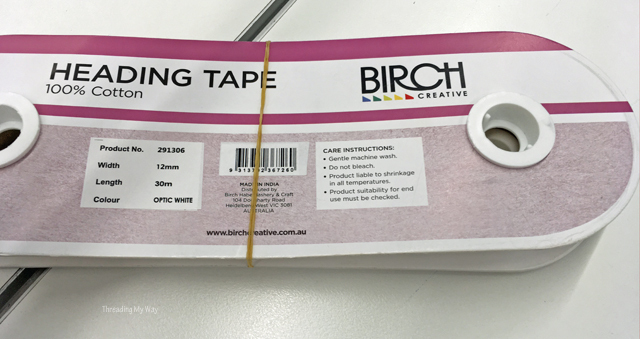 Birch is a well known Australian brand, so I'm sure the tape is sold the same elsewhere, too. I needed a lot of cotton tape for the one hundred drawstring bags I'm in the process of making. Progress is slow - I've only made seventeen bags. Option 1 is obviously the way to go. Purchase 20m and throw it into my reusable shopping bag - no plastic whatsoever. Option 2, meant unnecessary plastic and cardboard for every 5m. So, why, oh why was it considerably cheaper to purchase the prepackaged tape? The packaging alone should have increased the price. Apart from price, I can't for the life of me think of a good reason to buy the prepackaged tape. I suppose it saves a minute or two at the checkout. Is that a valid reason? I don't think so. to price the prepackaged tape more cheaply than off the roll. She agreed with me and said I wasn't the first to complain. Feeling as strongly as I do about unnecessary plastic packaging, you'd think I would have refused, and purchased 20m off the roll. But no, I came home with four packets of tape - complete with all the extra plastic and cardboard - and intending to contact both Birch and Spotlight for their reasoning. Why did I purchase the least environmentally friendly choice? The price!!! The difference was enough that I purchased the cheapest option. I can't remember the prices now, but from memory, I could get an extra 5m prepackaged for the same cost as off the roll. When I arrived home, however, I felt guilty as!!! I should have put my money where my mouth is. And I should have gone ahead and contacted the stores when I could still remember the prices. So, what are my options in the future? I'll definitely shop around. My local haberdashery store will give me a significant discount when I purchase whole rolls of elastic. I'm sure they'd do the same if they stock the tape I want. It doesn't have to be the same brand, although I do like to support Australian businesses. Made in Australia would be even better, but that's another topic. If I can't find the tape off the roll at the price I want, I'll just have to bite the bullet and pay extra. If nobody purchases the prepackaged tape, stores won't stock it. We do have buying power, but only in numbers. I'm obviously not the only one buying unnecessary plastic. I consoled myself with the fact that I recycle all soft plastic. We collect every single little piece of soft plastic that comes into our house and take them to redcycle bins. Of course, it would be much better to not bring the plastic home in the first place. 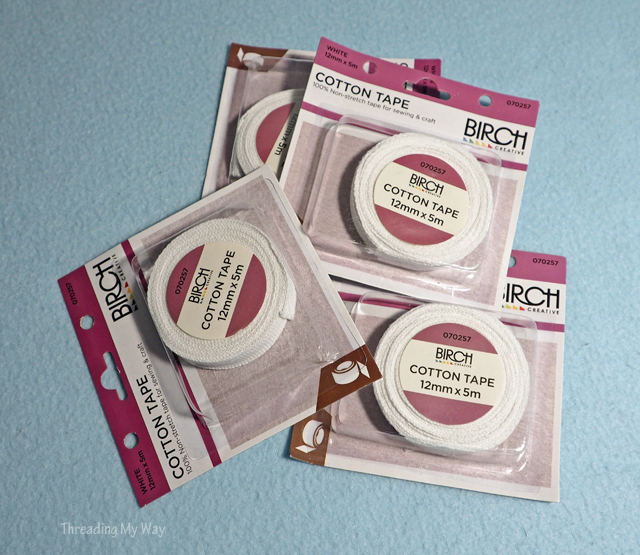 What experiences have you had buying sewing notions sold in your little corner of the world? I'm right there with you Pam. I'd like to put my money where my mouth is and I get it, but when it comes to my budget, I have to do what is easiest on my pocket book. I think the balance comes in when we can even if it isn't all the time. Some is better than none. Oh, same here, but the by-the-yard is also on a plastic holder, so does the store recycle that? Doubtful. Contacting the manufacturer is your best option, thanks for thinking of more ways we can reduce the plastic load. For example, ask Birch if they use recycled plastic to make their holders for the yardage. Every market created for recycled plastics will help more recycling get done. That is so frustrating! I don't know if there are etsy sellers with better prices there but I can often find bulk deals with good prices and minimal packaging that way. The stores do not reuse the plactic holders for by-the-yard as they have given them to me in the past when I managed to get twill tape on clearance for 5 cents per yard! Recycling is not as accessible here, especially in rural areas. We could definitely do more. I was actually chased down at the store last week for not placing my items in a plastic bag. He thought I was stealing and made quite a scene. Very embarrassing. I would have purchased the smaller packages with plastic, if they were considerably cheaper than bulk. We've gotten used to bulk purchases being cheaper, but I think, to a certain extent, stores have caught on to that and sometimes try to put one past us. You're lucky that you can recycle all plastics - I've never even heard of that. Most places (here, anyways) are quite stringent and *rigid* (hehe) in what plastics they accept. I did find out recently that our town accepts all kinds of textiles for recycling - including worn out, stained, torn ripped items and even fabric scraps from sewing! I do so much 'vintage' recycling that I would have bought the cheaper pre-packaged stuff. I buy very little "New" that I can balance that out with re-using items I find at garage/estate sales. I purposely look for way to reduce my landfill contributions by recycling, composting, and re-using. I don't have enough money to be wasteful from that direction either. No, I don't think you can avoid plastic packaging but you can look for less packaging. I also share your frustration with the packaging overload we have to deal with these days. I would love to be able buy my haby needs in bulk as well. However, as other commenters have stated, ultimately, it all comes down to the budget. I am very fortunate here in NZ that we gave a great recycling system. I am able to put all my cardboard, paper, hard plastics, glass and tins in my household recycling bin and our supermarkets and some of the chain stores have a bin where you can put your soft plastics, eg bread bags, plastic shopping bags, cling wrap, shrink wrap, etc. I also compost, so only put out a rubbish bin once every 3 months or so. If everyone does whatever we can, it all adds up and makes a big difference. Wow - only putting out a rubbish bin every 3 months is very impressive! You are so right, if everyone does their bit, it all adds up.